Valvoline’s Premium Blue Engine Oils are designed to provide advanced lubricant performance in modern, emissions treatment equipped diesel engines, including all types of Exhaust Gas Recirculation (EGR) and Diesel Particulate Filters (DPF). When used in conjunction with Ultra-Low Diesel Sulfur fuel, this product technology offers a long-life, extended drain capable*, balanced formulation which helps maximize engine durability as well as after-treatment cleanliness. 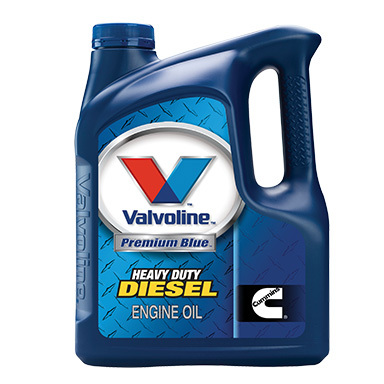 Valvoline’s Premium Blue Engine Oil is endorsed by Cummins and has been tested extensively by Cummins in stationary and EGR on-road engines, including engines powered by diesel, CNG and LNG fuels, as well as engines equipped with DPFs. It is tested and approved against industry standard specifications such as SAE, TMC and CES. To learn more about Valvoline’s Premium Blue Oils available for Cummins engines, please contact Cummins DKSH Sales and Service.